As an avid traveler and being a journey type of person, the following post on TechCrunch appealed to me. Much more important however is how this adds significant context and extends our ability to discover more relevant things, or in this case, places. Up until this point, since the launch of version 2 of its iPhone app earlier this year, Whrrl’s focus has been on storytelling. That is, allowing users to tag places they’re at with stories and pictures. But the latest version shifts the focus towards creating a digital record of all the places you go in the real world, Pelago CEO Jeff Holden tells us. “It’s about places, not location,” he says. My primary premise and passion around The Snowflake Effect is the vision of getting things "just right" as in just the right stuff for just the right people at just the right time in just the right context and so on. In the case of whrrl and other location-based applications, they are addressing the "just the right place" aspect of the equation and augmenting our ability to discover places that we will be delighted with. I've long cited music recommender technology such as Pandora, Last.fm, Slacker and Spotify as examples of how it is already possible to experience the power of augmented discovery. These sites have an almost scary ability to find more and more songs that are truly just right, just for you, just at that moment. Now we are beginning to see examples such as whrll which enable this same kind of just right discovery, but of places, not music. As has been my recommendation for these music discovery examples, the best way—really the only way—I know of to understand them and to determine their value is to try them. I make the same recommendation here with whrrl and other geo-location-based systems. Try them for 30 days and see what you think. And don't forget to share your experience with the rest of us so we can benefit from your unique discoveries. As most of you know, for the past two years I’ve been out conducting a grand experiment of learning, living, and working from my sailboat most of the time, as I explore and experience this phenomenal planet of ours from the vantage point of the sea. I am currently anchored at the small village of Rikitea on the Island of Mangareva, which is in the Iles Gambiers (cut and paste the lat/long pair 23 06.939S 134 58.098W into Google Earth if you’d like to see where this is). One of my primary drivers for heading off on this new direction in life, was to turn myself into a truly fulltime learner and dive into the deep end of the ignorance pool. I wanted to see if I could figure out how to swim and have fun doing it. It has been working extremely well too. Every single day is almost a nonstop set of learning experiences on just about every level you can imagine: personally, professionally, of other people and cultures, of geography, geology and archaeology, of all things mechanical, of the stars and solar system, of maps, of me and of the worlds above, below, and on top of the water. I’m finding that there is an incredible amount of very deep lessons to be learned, as well as some extraordinarily helpful concepts and models that apply themselves to so much more than “just” sailing and a life aquatic. One of these in particular, is a term unique to sailing called VMG which is the acronym for “velocity made good”. This one has really struck me as an enormously helpful conceptual model and it has stayed with me throughout my adventure. Now I’d like to share it with you here, get your comments on it and offer it as a model that I believe you too would find very valuable, both professionally and personally. Bear with me for just a bit while I quickly walk you through what VMG is all about in the context of sailing, and then I think you’ll quickly see how well this can be applied to most other things in life. VMG or “velocity made good” is the measurement of the speed at which you are progressing toward your intended destination. VMG is vector-based in that it requires TWO values—speed and direction—in order to determine what the VMG value is. Now, to get from point A to point B in a power boat, you’d simply follow the common principal that a straight line is the shortest distance between any two points, and you’d steer the motorboat directly towards point B. There would be no need for this special term of VMG because you’d simply measure your speed over the ground or through the water and that would be how quickly you were progressing toward your destination. In a sailboat, however, you are dependent upon the wind for your motive power, and it is not always possible to follow the straight line to your destination. For example, if the wind is coming FROM the point B you are trying to get to, then you have a problem. In fact, until relatively recently in the history of sailing, it was only possible to sail in about whatever direction the wind was blowing; that is, downwind. This is why, for example, all the historical sailing routes of the world went in similar directions and to similar destinations. You were essentially at the mercy of Mother Nature and you literally went whichever way the wind was blowing. To this day, many people assume that a sailboat is “pushed” by the wind and therefore, can only go downwind. But in fact, modern sailboats are not dependent upon being pushed, they can also and most often, be “pulled” by the same principle that enables airplanes to fly—lift. The sails are carefully shaped and angled such that they act as a wing and create lift, which combined with the similar lift being generated by the keel under the water, enables the sailboat to move forward. While it is not possible to sail directly into the wind, it is possible to sail within as little as 30 degrees off the wind, and therefore you can now move towards, although not directly at, your destination, even if the wind is coming straight from this point. The technique is known as “tacking” and if you were to observe it from above, the path of the boat would be a zigzag pattern, since the boat is steered first to one angle (say, off to the starboard or right side) and then back to the other angle (to the port or left side). By maintaining this angle to the wind, the sails and keel generate lift and move the boat forward, and you are able to tack or zigzag your way to point B. Because you are never advancing directly towards your destination, you’re always moving away from it to some extent; your actual speed on the water is of little importance. What you want to know is how much progress you are making towards point B and THAT is what VMG tells you. Unless you are moving in a straight line directly towards your destination, your VMG is always going to be less than your actual speed over the ground. But how much less? In approximate terms, if you are traveling at an angle of 90 degrees to your destination, then your VMG would be zero; that is, you’d never get there. Greater than 90 degrees and your VMG would be negative. So angles less than 90 degrees have some amount of positive VMG; therefore, you’d be making positive or forward progress towards your destination. How much would be a vector or combination of your actual speed and the angle. This is how VMG is calculated. Fortunately, on modern sailboats such as mine, there is a digital readout that tells me exactly what my VMG is at any moment and this reading is what you learn to pay the most attention to because it is the “bottom line” of how well you are sailing towards your next waypoint or destination. Figuring out when I’m going to arrive at this next point then is not based on how fast the boat is moving through the water, but what the VMG speed is. You therefore adjust your sails and angle of your heading not to get the maximum speed but to get the maximum VMG. What I’ve been finding even more fascinating though, is that if you remove the context of sailing and treat VMG as a general conceptual model, it becomes extremely useful in many other situations. Destination can now be any form we like, such as a personal goal or an organizational objective. As in the case of sailing, you are often faced with opposing forces that work against you and keep you from being able to move directly towards your point B. Some would simply “go with the flow” and let themselves be controlled and pushed by these forces, and therefore go in similar directions and to similar destinations that were all “downwind”. But if you really want to get to the point B that you have set your sites on, then it is possible to develop strategies that allow you to head “upwind”, without taking the opposing forces on directly, but very cleverly using those same forces to provide the metaphorical equivalent of “lift” to you and your team, thus enabling you to make forward progress, and ultimately arrive at your destination. Does this sound familiar? Do you recall times when you have purposefully decided to take an indirect path, meandering in different directions that move you closer but not directly towards your goal? If done with purpose, it can be extremely smart and enable you to go against the flow, to succeed in spite of opposing forces, and to get where YOU want to go. You can see how well this all fits into my long time focus and the namesake of this site—the strategy of being “off course” and yet very much “on target”. Yet for me the real lesson of VMG is in the value of having an accurate measurement of what my VMG is. This is where I think we can also gain the most advantage in using the concept of VMG in other applications. What we need is a VMG meter for all of our other pursuits in life! In many ways, I think it can be relatively straight forward to create a VMG meter for any application. First, of course, we need to have a clear and accurate sense of where point B is. What is the end state we are trying to achieve? What are the coordinates of point B? Then we need to know our current location, where we are now. And finally, we need to know what is our actual speed AND at what angle away from our determined destination are we moving? Put all these together and you get a very simple, but profound, guiding metric of your true progress. Think how well this would let you make adjustments to your strategies and implementations, and how quickly you could find out what effect this has on your VMG. For example, moving faster often seems to be a good thing: “We must be doing well, look how fast we are going!” But how often has it turned out that you were making LESS progress towards your goal, even though you were “going faster”? When would it be smart to choose to go slower at a different angle to reach maximum VMG? As with many of my “off course, on target” stories, including the original Apollo mission example that got me started with this whole line of thinking, it is all about getting good at constant course correction, which requires that you know where you are headed and how far off course you are at any given point in time. So give this VMG idea a try in YOUR context. How well have you quantified the specifics of your “point B” destination? How would you measure the “angle” away from the direct line towards your point B? How do you measure the speed that you or your project are moving at? If you can measure these, then you can put them together and create your very own VMG gauge, which will let you make constant course corrections and successfully reach that elusive point B destination before everyone else. Would you rather join the rest of the crowd, go wherever the prevailing winds blow you, and let the external forces determine your future? Or would you like to chart your own course? Do the impossible and sail upwind. Fashion your own version of a VMG gauge, and you can purposefully put yourself very much off course, but equally much on target! I am as remiss as I am delighted to be able to finally get around to sharing some of the fascinating work taking place on one of the world’s most remote locations, Rapa Nui, also known as Easter Island, and to introduce you to some of the even more fascinating people doing this work. Most of us are probably familiar with the mysterious stone carvings on Easter Island called Moai (pronounced mo´-eye) and they are indeed impressive. Some of you may recall the book “Collapse” by Jeffrey Diamond and recall how he used Rapa Nui as a blueprint or roadmap to societal implosion, all of which seems all too relevant and most valuable in these current times. However, even more impressive is the story of the people and the history that lies behind the blocks of stone. It is in part a story of great sadness and devastation as the residents desecrated the island (and nearly themselves) by clearing literally every tree in order to create these statues. Yet this is also a story with great hope and inspiration as these challenges are being resolved with remarkable human ingenuity and determination augmented by some of today’s hardware and software. I continue to be more and more fascinated by the whole new solutions and results that emerge when we mix or “mashup” the old with the new, and these efforts on Easter Island are yet another great example. Jeff O’Brien has recently done a great job of telling this story in his Jan. 13, 2009 Fortune magazine article “Saving Easter Island” and in this accompanying video interview. I am very confident that you will find it a good use of your time to take a few minutes to read the article and watch the video. Together Pete, Sonia, and a team of other people from local and from other technology companies are in the process of digitizing the whole island to create models so accurate you can now see the original chisel marks from when the Moai were carved out of the volcanic rock blocks. It is from lessons like the ones coming out of this work on Easter Island that Autodesk and all of us can learn more about how to combine the past with the present to make a much better future. Pete originally went to Easter Island out of pure curiosity and to check off one of the items on his “Bucket List” (name of a highly recommended movie BTW) of things to do and places to see before he “kicked the bucket”. However his curiosity and talent soon led him to connect up with Sonia. And the rest makes for a great story that is still unfolding, but you can get started on with the article and video. * You can also track the whole project on the Easter Island project diary blog. Best of all, I will soon have the great privilege of meeting some of these people in person and seeing their work first hand, since I am about to set sail for this remarkable remote island this month. I’m currently in Costa Rica finishing preparations on my 50’ sailboat “Learnativity” and expect to set off later this week for Ecuador and the Galapagos Islands from where I’ll turn south and make the open ocean crossing to Easter Island. If you get out your atlas or fire up Google Earth, you’ll get a better sense of just how remote Easter Island is and develop a bit more appreciation for the importance and the challenge of the efforts being made there to build a whole new future for the island and for the rest of us. I strongly encourage you to take a few minutes to read this article and watch the video. I think you’ll soon become as fascinated with this as I am and a bit more aware of the wonderful diversity and vitality that is on this planet we share. There are lessons for all of us and on many levels including geographical, historical, sociological, and personal to be gleaned from the history of Easter Island, as well as its present and prospective future. I look forward to reporting back to you when I’m on Easter Island with more photos and stories of some of my personal experiences, interactions, and perspectives. Until then, enjoy some virtual traveling and some learning from the comfort of your chair, and please join me in a salute to the ingenuity of people like Sonia, the energy and spirit of people like Pete, and the great mashups of old and new that can help make this a better place for all of us. I’m in Miami today finishing up my most recent set of business trips around the planet and catching my flight back to El Salvador. I had the great fortune of spending last night and this morning with a business colleague who lives on the waterfront of the always interesting Miami Beach area. Thanks Eric! For me, Miami is one of those grand cities of the world that exemplify uniqueness. As with cities such as Istanbul, NYC, and Paris, it is truly a unique combination of cultures, architecture, experiences and people, with little connection to the country it is in...a world onto itself, a city that you need to simply enjoy and try to learn from. As so we did just that as we walked around the South Beach area, enjoyed some local food, people watching, architecture and the pulse of life. While exploring this area, I ran into what struck me as an interesting example of how to combine customization with standardization. In this case, it came in the form of a Publix supermarket, which is part of a chain of supermarkets that is very popular in the southeastern USA. As best as I can tell, Publix is popular with those who shop there because the reputation they have built up for consistent quality, large selection of mid- to high-end food items and the overall design and ambience of their stores. What I’ve picked up on in my visits to several of these stores in the past few years (and from talking with friends and others who shop there) is that they have built up a very loyal following of customers who seek out these stores wherever they are. That’s the “standards” part of the equation—delivering on the expectation that you will have a consistently good experience in any one of their stores. However, this particular store is located in a very affluent and “stylish” residential marina area on the waterfront of Miami Beach, and so there were significant concerns by those living in the neighborhood (and those looking to move there) that this store would be very out of place architecturally and at odds with the feel of the neighborhood which is filled with condos, waterfront walkways, parks, etc. The solution that Keene Construction came up with was to take a very standard Publix building and layout and wrap it in a very unique exterior that fits well with the neighborhood. As you can perhaps make out in the photo above, the exterior is very striking, based on a nautical theme with the suggestive shapes of boat hulls, sails, and decks. Yet when I passed through the exterior doors, I walked into a very familiar and standard Publix supermarket. I thought it was a great mashup of the best of both customization and standardization. From the outside, the store is a delightful part of the area and it's ambiance both fits in and stands out at the same time, adding value rather than subtracting from it. It was also interesting to read some of the comments on this store on Yelp, the community review site, by those who shop at this store. Interestingly some of the comments were from people living nearby and others were from those visiting the area from far and wide. This is just the latest example of the growing importance of design: how to mix opposite ends of the spectrum, such as old/new, standard/custom, or consistent/unique. It has left me asking my usual question, “What is this trying to teach me?” and so I’m pondering how we could abstract from the lessons here and apply this type of mashup to things beyond architecture, stores, etc. How could we apply this to human interactions, to software development, to content development? * Just the right things, for just the right people, at just the right time, in just the right place, in just the right context, etc. Not that I’ve ever had a schedule in any typical sense of the word, but now I will have a very different one for the next month or so, and it will have some spillover effect on my writing and recording here on OCOT. I’m currently in Antigua, Guatemala completing the first of what will be four weeks of intensive immersion Spanish language learning. More on this in an upcoming post. Here are just some related updates for you now. I suspect that I’ll become more fascinated with languages than I already am and always have been, so be prepared for a focus and theme on languages in many of the postings for awhile. I’m already getting more and more excited and passionate about some of the enormous demands and potential opportunities I see for increasing our multiple language capabilities and competencies at a rate to match the world of exponential change that I see us living in. Immersion language learning is also very cognitively exhausting (especially when you don’t have a very big cog! ), and between my actual “class time” and homework (which is taking up 6-10 hours a day or more), it’s a bit more of a challenge to fit this into what’s supposed to be a part-time job. And so I’ll not be writing the long (lucky you!) or deep articles that have been my custom. That in itself will be a fun change for me (and you too), since I’ll try to do more frequent and shorter postings that are simply meant to make you aware of something new and allow me to just pose some provocative questions based on things I’m pondering at the time. Who knows, maybe I’ll not only learn Spanish, but I’ll learn to how to talk and write in English with greater brevity and clarity! Hey, stop that snickering! I can hear you all the way over here in Guatemala! ¡Hasta la próxima vez mis amigos! In "New Perspectives: The Benefits of Looking up! ", we looked at the value of new perspectives in general and one perspective in particular—looking up more often to learn from the stars, sky, and space. Using the new Sky feature of Google Earth as an example, we also looked at gaining yet another perspective—by flying—and how we could tie two perspectives together to do things such as looking up at the stars to help us navigate our way on land and sea. 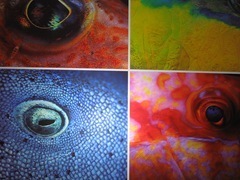 Now I'd like to continue with our exploration of the power of perspectives by looking down and under. One trick I've found extremely useful for helping me solve problems and finding new perspectives is to invert things. For example, I remember how amazed I was as a young boy when I discovered that a telescope becomes a microscope (or vice versa), when you simply look from the other end! Ever since, I've tried "looking through the other end" or inverting my thinking as much as I can to learn more, gain new insights, and see things more clearly from a new perspective. Applying this inversion technique to the Google Sky example, what I'm hoping for next from Google or other providers of similar technology is the ability to point that camera in yet another direction—down! How about a "Sea" feature that would let us point our attention and camera the other way, down to what makes up over 71% of the Earth's surface; the oceans. It seems to me that we could learn a lot and gain many new perspectives by looking at what some call "Inner Space", the world's oceans and waterways, with at least the same intensity and resources we devote to Outer Space. Here is a brief and sobering overview of how little we currently know about the watery world around us, and some equally exciting projects that are tackling this deficit and revealing just how much we can gain from looking at it. Let's start by checking out the Sept. 4th, 2007 article in the New York Times called "Bringing the Ocean to the World, in High-Def", which covers the new Ocean Observatories Initiative as well as some other very exciting major projects aimed at filling in a lot of our missing knowledge about the oceans that surround us. These endeavors are important because the oceans contain the vast majority of the earth's living space. Placing a range of sensors in the oceans to provide directly measured data. Connecting all these sensors through the Internet so that all of the information gathered is accessible to the public and the scientific communities. "a multifaceted effort to study the ocean—in the ocean—through a combination of Internet-linked cables, buoys atop submerged data collection devices, robots and high-definition cameras. The first equipment is expected to be in place by 2009." From my perspective, we are in DESPERATE need of this proliferation of study and these approaches. I always thought it curious that we know so much more about "outer space", relatively speaking, than we do about the oceans around us or our "Planet Ocean" as it is sometimes referred. Think I'm being too hyperbolic (who me?!!)? Check out some of the following facts—some fun, but many that are are very serious and sobering. 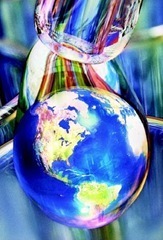 Water is the only known substance that can exist as a gas, liquid or solid within the limited temperatures on Earth. The oceans cover 71% of the Earth's surface and contain 97% of the Earth's water. Less than 1% this is fresh water, and 2-3% is contained in glaciers and ice caps. All life on earth is thought to have originated in the ocean. An estimated 80% of all life on earth is found under the ocean surface. Over 1 million known species of plants and animals live in the world's oceans, and scientists say there may be as many as 9 million species we haven't discovered yet ( = almost 90 % UN discovered!). 96.5% of the total water on earth is in the global oceans. Oceans contain 99% of the living space on the planet. Less than 10% of that space has been explored by humans. The average depth of the ocean is 3,795 m. The average height of the land is 840 m.
90% of all volcanic activity occurs in the oceans. The top ten feet of the ocean holds as much heat as the entire atmosphere. One study of a deep-sea community revealed 898 species from more than 100 families and a dozen phyla in an area about half the size of a tennis court. More than half of these were new to science. At best, it is estimated that we have only mapped about 10% of the ocean floor in any detail. So what? 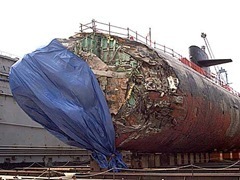 Remember the US submarine San Francisco that crashed into an underwater mountain near Guam back in January 2005? While the details are still under investigation, the biggest factor is the simple fact that we didn't know the mountain was there! Don't know what we don't know! As stunning as some of these facts are in revealing how little we know about "Inner Space", recent studies are strongly suggesting that our ignorance is MUCH larger! And this isn't just because the oceans are so obviously vast. We don't seem to do much better with waters that are very close to us land lubbers. For example, consider the recent study (Jan.2006) of the Gulf of Maine done as part of the Census of Marine Life, with the Huntsman Marine Science Center of St. Andrews, New Brunswick, which found in their first count of known marine species in the Gulf of Maine region (3,317 and counting) was more than 50% larger than previous estimates! As an added bonus and as a Canadian, I was also tickled to learn that Canada is putting in its own cabled network for more of the Straits of Juan de Fuca off the coast of British Columbia, which is where I last lived in Canada and where the rest of my family lives. In another post, I'll add some overview comments on the meta-trends and patterns that are emerging in both these recent marine examples as well as the likes of Google Sky, which we covered in New Perspectives: The Benefits of Looking Up. 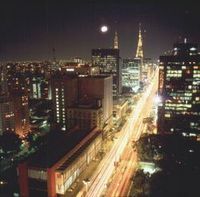 In my previous post, I told you about my adventure getting to this year's eLearning Brasil 2007 conference in São Paulo. The theme of this year’s event was The Influence of Leadership and Technology on Organizational Learning and Performance. The conference itself was (and always is) very interesting for me and for all the attendees, based on past and present conversations and comments I have received. 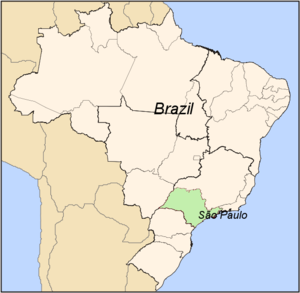 Obviously the majority of the attendees are from Brazil, but a growing and significant percentage of attendees are from other South American countries, such as Argentina, Chile, and Ecuador, as well as from Europe and North America. A full range of academia, especially universities and trade schools, commercial businesses, government personnel, and technology vendors are also well represented and are similarly diverse geographically. Along with the eLearning conference, there is an awards ceremony for an annual competition t on technology that supports the visually impaired. The results are always amazing, and this year was no exception. So you can see why this is one of the only events that I regularly attend and why I get so much out of it. As I mentioned earlier, Elliott Masie came to the conference via Internet-based video from his home in Saratoga Springs, New York, which worked extremely well. Elliott covered a range of key issues that he sees coming up over the next few years as well as some that are appearing now. For example, he noted how people worldwide are feeling overwhelmed and distracted and the impact this is having on learning and performance. In this context, Elliott posed the question of whether good learning can take place at your desk and particularly, at work or on the job. Next we discussed with the audience how there are similarities between cooking and eating, and learning and training, a comparison Elliott and I have found fascinating and valuable for several years. We reached a consensus that there are deep similarities between these two very human practices, so much can be learned from comparing them. The connection between learning and the world of food and eating appears to be so strong that Elliott is having master chef Bobby Flay join him at Learning 2007, where he will be cooking while Elliott is interviewing him about the design, innovation, and evolution of cooking, and how it relates to our world of learning. Best of all, we will get to sample some of what Bobby has cooked up. Now THAT is performance and learning at their best, don’t you think? ? Contrary to the rhetoric that large numbers of workers are retiring and so we should be concerned about the “brain drain” that this would produce, we are seeing the opposite happening in several ways. First, just because people are eligible to retire based on age and years of employment, doesn’t mean they will, and indeed many are choosing not to. While in many cases, this change in the age of the population may involve a change in the kind of work and conditions, such as shorter work days or weeks, more flexibility, different roles, or more of a facilitative and consultative role, the real change is that people are living longer and working longer…A LOT longer. Secondly we noted that this change would produce a broader range of chronological age among individuals on a team and in an organization. In many places, for example, we are seeing people enter the workforce earlier, sometimes because they are sought out by employers and are convinced to leave their education and training programs earlier because they already have sufficient skills and the knowledge that is so badly needed. Combined with the people from other end of the age spectrum, we can expect teams whose membership spans teenagers to centenarians. A good discussion ensued on what this means for learning and for working. An audience member from the São Paulo area talked about the challenge his company is facing from the lack of people with engineering talent and what should be done about this. The ensuing discussion found that this phenomenon is broad-based in most countries in the Americas and Europe and quite the opposite in developing regions, such as India and Asia. The discussion included the trend of “mass contribution” by increasing numbers of people. Knowledge and expertise is now being captured through e-mail and instant messaging to blogs and wikis. There is, however, a missed opportunity to “mine” the growing repositories of such communications for the nuggets of knowledge, patterns, and other value within. One of the things I value about the support I’m afforded from Autodesk is being able to spend time with bright. eclectic people in different locations on this planet every day. This gives me the chance to test just how broad and applicable are the trends that I see. This diverse range of people from Brazil and South America confirmed once again just how powerful these notions of mass personalization, mass contribution, and the Snowflake Effect really are and how well these translate into their context. Given this tremendous validation and confirmation from so many locations and so many contexts, my close colleague and friend Erik Duval and I are hard at work developing the Snowflake Effect into a full conceptual model and articulating this in much greater detail. Please stay tuned for upcoming announcements when we will have a site dedicated to the Snowflake Effect where we will be asking for your input, reactions and critiques. For now, I hope you find some good value from my most recent experience in the great metropolis of São Paulo. And my sincere thanks to Francisco and the super staff of MicroPower for the great job you do of making eLearning Brasil somehow better every year. It’s an honor and a privilege to be a part of the whole experience. Despite the travel gods’ best attempts to keep me from my goal, I finally made it to São Paulo, Brazil 52 hours after leaving San Francisco. It all started with an emergency landing in Denver due to an electrical fire, which caused me to miss my connecting flight. I was rerouted through Newark, then shuttled to JFK, where the next leg of my journey was delayed because of fog in São Paulo. Two flights later I finally arrived at my destination. 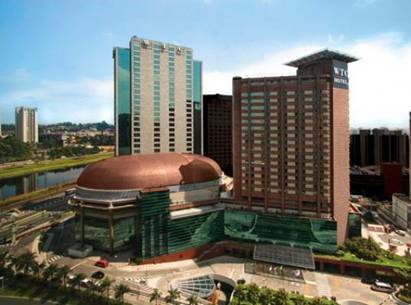 I had been asked back to São Paulo for the third time to emcee and facilitate the eLearning Brasil 2007 conference at the beautiful São Paulo World Trade Center (see photo at right). And in spite of the unique challenges I faced getting there this year, once again I found it well worth all that I went through to be part of this annual event. In fact, the whole experience fit right into the theme of this year’s event, The Influence of Leadership and Technology on Organizational Learning and Performance. While I was stuck in the JFK airport in New York, I used phone and instant messaging to contact Francisco Soetl, MicroPower CEO and the wonderful mastermind behind the “eLearning Brasil” events, to update him on my changing itinerary. Over lunch at a JFK restaurant, I made an Internet connection on my laptop with my Verizon wireless data card and downloaded a very effective new collaboration environment called MicroPower Presence that Francisco and his talented team have developed. We used this to provide VOIP (voice) and share some slides for a quick meeting with his team in Sao Paulo to set up a series of different plans, depending on whether I got there on time, late, or not at all. I also connected with Elliott Masie, who was going to be doing a keynote at this conference via video from his home base in Saratoga Springs, New York, and did some planning with him. Elliott, via his shiny new iPhone no less, was on his way to the opera at the time, but we quickly set up plans for my interview with him, whether it would be from the stage in Sao Paulo or by driving from JFK up to the Masie Center in Saratoga Springs where both of us could be beamed into Sao Paulo via video and the net. Boarding the plane (finally! ), I sent Francisco and Elliott a text message update that I was on my way and when I was scheduled to arrive in São Paulo. (6:50 am). Finally on the ground in São Paulo at 6:50am local, but since no phones were allowed during the 90 minutes in the immigration and customs lines, I had a tense bit of non-communication time. By the time I was in the taxi the conference had begun, so I switched to text messages and mobile blogging using my phone. If you’ve never been to São Paulo (and you really should go!) then just try to imagine traffic in the world’s second (or fifth) largest city (depends how you count). Picture a city with about the same population as New York City (19+ million), but with only one fifth the land area, and about ten times more cars and trucks, and a thousand times more bicycles, mopeds and motorcycles. Got the picture?! If you are imagining a lot of smog (among the world’s worst) and lots of helicopters (the most per capita in the world) and lots of high rises (7th in the world), you’ve got it about right. Oh, and did I mention this was all during morning rush hour?!! Fortunately a good colleague, Eric Shepherd, was also attending this conference and was in the audience. Eric is the CEO of QuestionMark Corporation, one of the world’s leading developers and suppliers of assessment systems and services for education and training related assessments. He was going to be on the Socratic Panel I would be facilitating in a few hours. Eric and I were able to do some mobile blogging while I was in the taxi, which enabled him to send me continuous updates on what was being said on the stage, what were the audience reactions, etc., and provide me with the much needed context once I was on stage (let’s hope) and facilitating conversations with the other keynoters and panelists. In return, I was able to keep the organizers updated via Eric, on my whereabouts and ETA at the convention center. When it became doubtful that I was going to make it to the conference in time Eric kindly offered to take the stage on my behalf and start the interview with Elliott when he finished his keynote address. Finally, in what I think is the closest I’ve ever come in almost 20 years to being late for a speaking engagement, I dashed from the taxi as it pulled into the Sao Paulo World Trade Center, caught the elevator to the convention center, and ran onto the stage 3 minutes late and in time to thank Eric as he handed me the microphone and I started the interview with Elliott. That counts for close right? But it also counts for just doing what it takes to make things work. I thought this was a good example of how the combination of great people with the right “can do” type of attitude, and the clever use of whatever tools and technology we have around us, can overcome unexpected situations and still get the job done to everyone’s satisfaction. I'll talk more about the conference itself in my next posting.